Streisand's six-city, 1994 tour grossed (according to Pollstar) $58.9 million. She came in #4 for the year behind the Rolling Stones, Pink Floyd and the Eagles. Her numbers were impressive: Streisand averaged $10 million per city and set records at Madison Square Garden with her $16.5 million earnings there. Streisand ended up performing a total of 24 concerts in 1994—24 being her lucky number. 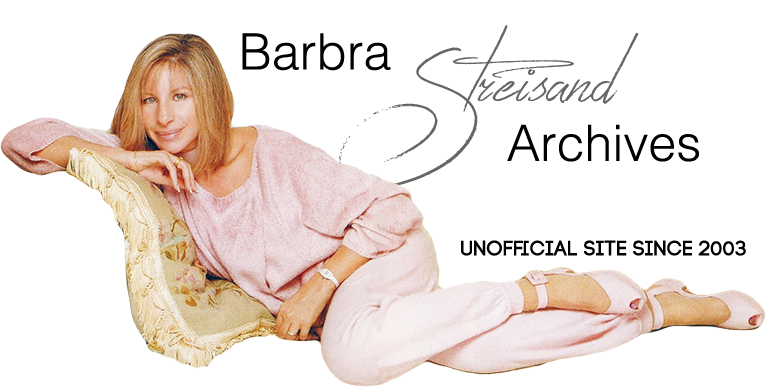 The Streisand 1994 tour program was 14" x 11" and 28 pages long; it was full of beautiful color and black and white photos depicting Barbra's career. Streisand's tour also included concert merchandise: hats, ties, watches, programs, and T-Shirts. These items were sold at the concert venues, as well as at special Barbra Boutiques at department stores like Bloomingdale's and Macy's. Backstage after one of her Detroit shows, Streisand spoke with L.A. Times music critic Robert Hilburn about the concert tour. Hilburn: How could you have stayed away from live performances for so long? Don't we hear all the time about performers needing the love and applause of the audience? Streisand: I understand how people can feel that way, but that's not a way I fulfill myself. I don't enjoy the spotlight. I really prefer the privacy of the creative process. Q: Wasn't there a time when that acceptance was important to you, say back in the beginning when you were playing clubs? Q: Did you enjoy playing Vegas in the late '60s and early '70s? A: I never wanted to do it, but I was a performer...a singer and this is what performers and singers do. It was my job. But every night I was terrified... So, I ﬁnally decided: "I am not going to do it. Why put myself through such misery?" Q: What made you change your mind after all these years? A: [Clothes designer] Donna Karan gave me a wonderful birthday party and Liza Minnelli got up to sing and I am sitting there thinking, "How does she do this? How does anyone get up in front of people and sing?" I could never get myself to sing at parties... with people looking at me. I can sing on stage because it is a black curtain out there. I can just see a few people and even that disturbs me. So I was fascinated just watching her. Q: So it became a challenge? A: That's right. I didn't like accepting that fright. I am frightened by a lot of things, but what I hope is good about me is that I go through the fear. I thought, "Why can't I do this?" Besides, so many fans wanted me to sing live. People were saying, "You owe it to them." It was starting to get to me. Plus, several things fell into place. Kirk Kerkokian [owner of the MGM Grand Hotel, where Streisand made her return to live performances last New Year's Eve] asked how I would like to give away $3 million [to causes of her choice] without any obligation to open the hotel. That impressed me... plus the show was going to be New Year's Eve. I hate New Year's Eve. It's a very lonely night for me... never a happy time. There is such an obligation to be happy. So I thought: What a great way to escape New Year's Eve...doing a show. And finally, my movies weren't ready. I was working on the scripts to "Normal Heart" and "The Mirror Has Two Faces," and I couldn't get them ready in time to shoot. So, the timing was right. Q: Why didn't you take the easier option of just doing a greatest hits show, instead of a more ambitious, scripted show? Q: Back to the tour, how nervous were you at the start? A: Very nervous. Even in London, I was listening to meditation tapes just before I went on, trying to have a positive attitude because I easily get sidetracked into this abyss of fear and I have to get myself out of it. Q: Were you still nervous on stage tonight? A: No, I think I have gotten past it [to some extent]. I don't have to listen to the tapes. I don't feel I need the critics to like me or not. But I am not without fear. It's just that my heart isn't palpitating where I think I can't make a sound. I've found that I can do a good show without being frightened to death. Q: So, has all this changed your mind about touring? Will you do more? A: No. This is it. Q: How could you not want to experience all that applause and affection again some day? A: Because I want to make movies. Directing is what I love. It is about having a complete vision—having a dream. It is waking up in the morning or looking at something in the street or at somebody's face and thinking, "Turn the camera on that." It involves everything I love to do—including dealing with people on a psychological level, trying to get the best out of them. It's about going toward the real emotion, getting a moment of truth on the screen. That is what, really interests me...all the aspects of putting something together. Q: How about the loyalty of the audience? Are you touched by that? After an hour in the dressing room, she broke away to attend a party given in the arena lounge by some of the musicians in the orchestra. She sat with longtime manager Erlichman and songwriters Marilyn and Alan Bergman, who scripted much of the current show. Following the band's set, Streisand, in a more relaxed off-the-record session, was ready to talk some more, good-naturedly debating the merits of some changes in the show since Las Vegas, including making the ending more upbeat than melancholy, and a more serious discussion of the media treatment of celebrities. Ever the perfectionist, she was on the phone again the next morning with some more thoughts, things, she said, that came to her after reﬂecting on the conversation the night before. The thoughts included comments about the media and what she sees as a cynicism about artists who speak out on public issues. "It is as if we give up our citizenship when we become entertainers," she says, sharply. Mostly, however, she wanted to talk about the show and the audience. "This tour is coming at a good time in my life...a time when I have leamed to see things more positively," she says, softly. "As a performer, for instance, I am interested in pursuing excellence, but that doesn't mean I always achieve it. I hit and miss all the time, including in these shows....but I think one of the things that is important in life is to learn to accept your imperfections, which is something that I couldn't understand for years." She pause.